In this approximately 30-minute podcast, I demonstrate the foursquare iPhone app and describe opportunities for improving its accessibility to blind users who rely on Apple’s built-in VoiceOver screen reader. Advocates have started a topic on foursquare’s Get Satisfaction community forum and blind foursquare users are asked to post comments about their experiences with the app and to describe how they would like to see its accessibility improved. I have also created this demonstration for the benefit of those at foursquare with whom a number of us are in discussions about opportunities for enhancing its accessibility. While Arizona did not observe the Sunday end of Daylight Saving Time, some iPhones in the state configured with default settings did, falling back an hour along with those in the Pacific time zone. April, an AT&T customer service representative, reported that the issue involves the configuration of time zone support in the iPhone’s Mail, Contacts and Calendars settings. By default, time zone support is on and set to Cupertino. These steps will work for sighted users who are not running the VoiceOver screen reader for the blind. Instructions for blind users follow. Tap the button to turn Time Zone Support off. Press the Home button to move to the Home screen. Flick left or right to locate the Settings icon. This will be found on the first page of most iPhones. Flick right several times to locate Mail, Contacts, Calendars. Double tap Mail, Contacts, Calendars. Double tap “Time Zone Support, On.” You are now in the time zone support window. Double tap the button to turn this feature off. The iPhone will now pull all its time zone information from the cellular network. Press and hold down the Sleep button on the top of the iPhone for two seconds. Double tap the Power Off button. Single tap the button if you are not using VoiceOver. The iPhone will announce it is shutting down. Wait 5 or 10 seconds. Hold down the Sleep button for two or three seconds to start the iPhone. Allow 10 to 15 seconds for the iPhone to fully power up. If you use VoiceOver, its active status will be announced. The iPhone starts in a locked state, with the current time shown. Flick to the left a couple of times to hear it announced. Flick to the right twice and double tap to unlock the iPhone and go on your merry way. As always, comments, corrections and all constructive feedback is useful. The popular Foursquare iPhone app used all over the world to check into and learn about new places is usable by blind people, but it’s accessibility could be significantly improved by the developers. A new topic was posted Tuesday on Foursquare’s Get Satisfaction forum asking for labeled buttons, fields and other controls to reduce confusion and make the iPhone app easier to use for blind people who rely on Apple’s built-in VoiceOver screen reader. We ask all who regularly read this journal or follow us on Twitter to review this topic and leave your own comments. This app has featured many unlabeled controls for a long time now. It’s only through vigorous participation that we’re going to get Foursquare to pay attention to our concerns and fix the accessibility issues. Karen brings me an interesting grocery package to identify with oMoby. A demonstration and discussion of iPhone camera orientation follows. Locate oMoby on your Home screen and double tap its icon to launch the app. Four-finger flick down to move to the bottom of the window, where you will find the Settings button. Flick left once and double tap the Take Photo button. Options for adjusting the camera are shown. Four-finger flick down to the Take Picture button. Orient the iPhone in the vertical position with the Sleep button on the top and the Home button on the bottom to take the picture in portrait mode. If a wider view is needed, orient the iPhone 90 degrees to the left, counterclockwise, of the vertical position so that the Home button is on the right to take the picture in landscape mode. Double tap the Take Picture button. A camera sound is heard and a snapshot of the object is taken. Four-finger flick down to the Use button and double tap it to have oMoby upload the picture for analysis. Flick left and right around the screen until you locate the newest entry in the list that says “searching.” Once the object has been identified, another screen will appear containing the identity of the object along with a lot of search results you may not find useful. Use the two-finger scrub gesture or find and double tap the Back button to return to the list of identified objects. 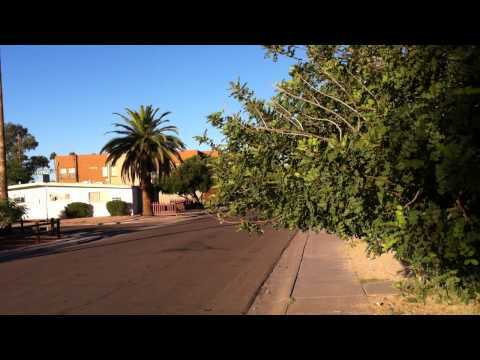 Tree branches extending over a sidewalk in the 1900 block of East 10th Street in Tempe, Ariz. pose a hazard for blind walkers who may bump their heads. This video demonstrates the safety concern.